An investigation of the theme of Transparency in the Canadian Federal Government. Non-partisan: Power corrupts and Absolute Power corrupts absolutely. Our model: the muckracker journalists. The land that is now called Québec province was shaped during the last two million years by cycles of glaciation / deglaciation (the Ice Ages). Many times the earth was scoured by mile deep glaciers and the rocky debris they carry. This is a land of lakes, ponds, rivers, streams and creeks. Water - or snow and ice in winter - is a predominant feature of our landscape. (The canoe was the primary mode of transport among the First Nations peoples of this land.) 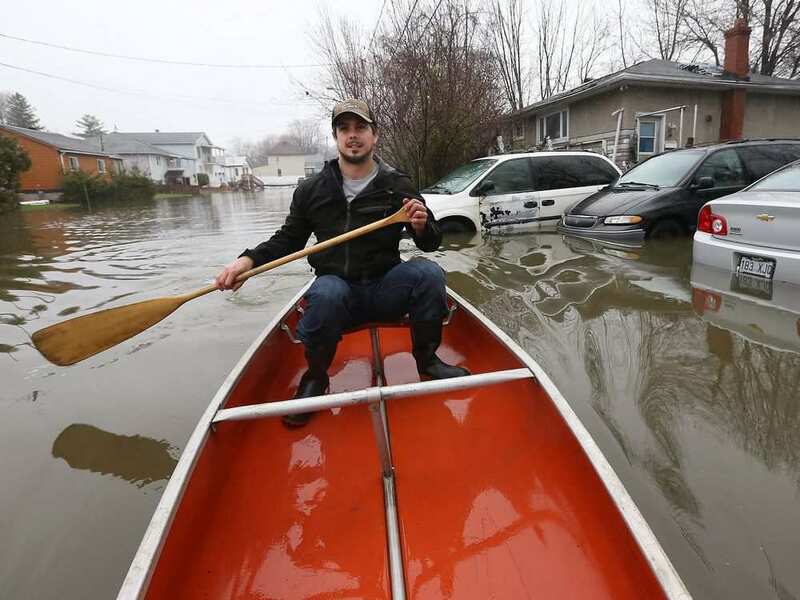 Spring flooding is the norm in many parts of the province. 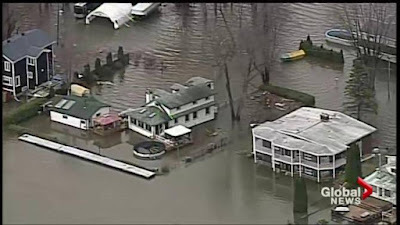 However 2017 is turning out to be an annus horribilis, a perfect weather bomb of late heavy snowfall and record or near recordbreaking spring rain..
"As water levels continue to rise in the national capital region, a climate scientist is warning flooding and extreme weather events are here to stay, and says homeowners should prepare. 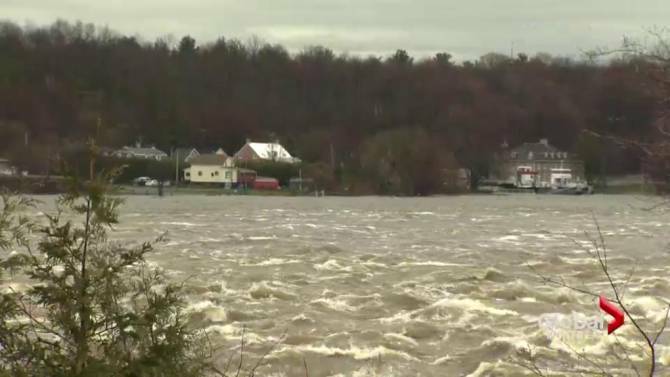 Swollen rivers and streams have threatened hundreds of homes in the Outaouais thanks to recent heavy rainfall — three times the normal amount since April 1. 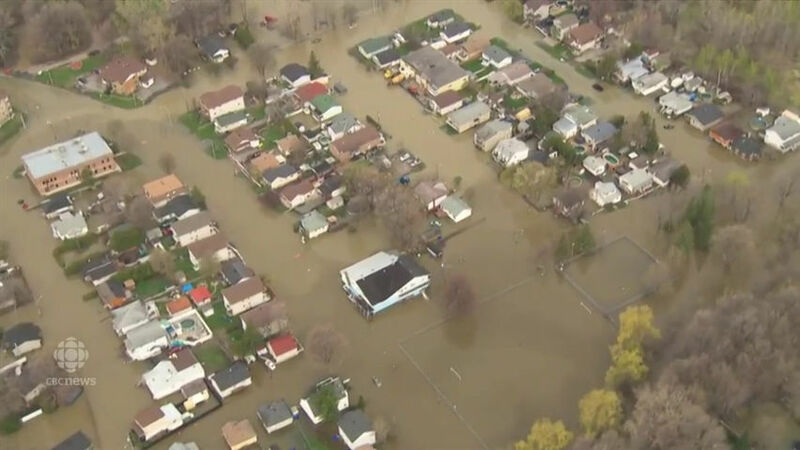 University of Ottawa climate scientist Paul Beckwith says that's due to a changing climate, and says we're seeing its effects "on a day-to-day basis" in weather patterns. "What we can see is that the jet streams are behaving differently. They're much slower, wavier, and storms are therefore moving slower. So when they're carrying water, they're hovering over an area longer than they would be normally, so they're depositing more water," Beckwith told host Hallie Cotnam on CBC Radio's Ottawa Morning." 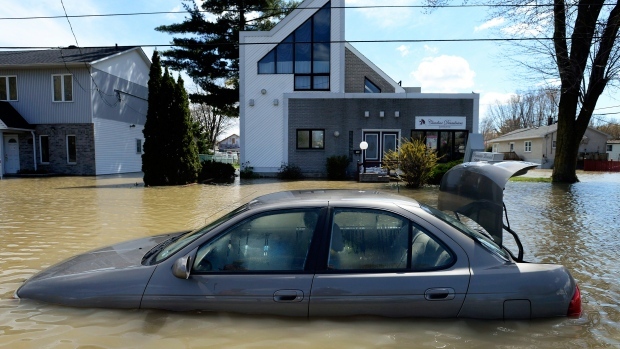 And with continued global warming, we should expect more of the same. 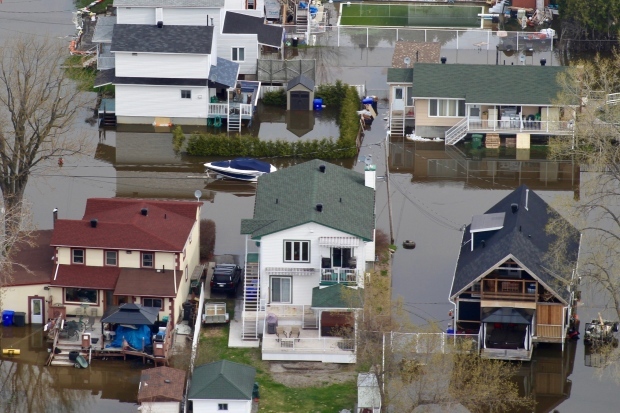 What we are seeing this year is a foretaste, most likely, of our future climate. Better get used to it..
Rigaud, Québec: a town built in a flood plain, used to flooding but this year is special. 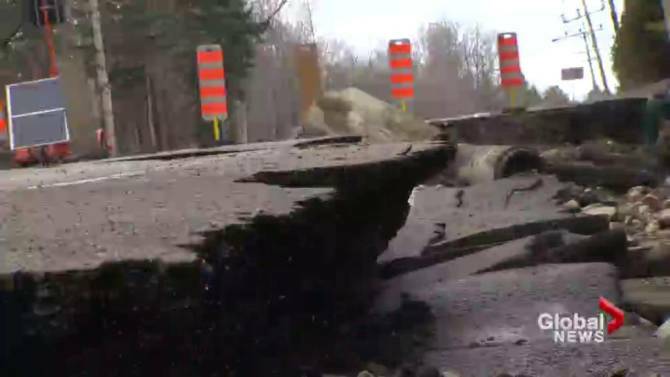 Rigaud, road washout. And was there an injury associated with the skewed car? 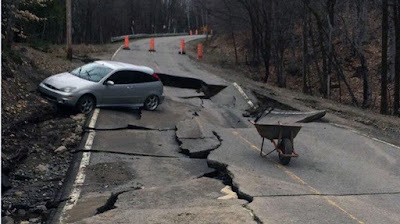 If so, more "collateral damage" of economic "progress" at any price..
Gatineau, western Québec, 4th largest city in the province, April 21 - two weeks ago! This flood season is stuck in high gear and we probably haven't seen the worst yet. As I write, meteorologists are calling for heavy rain throughout southern Québec - including the flood zones - for the next three days, May 5 - 7, 2017. 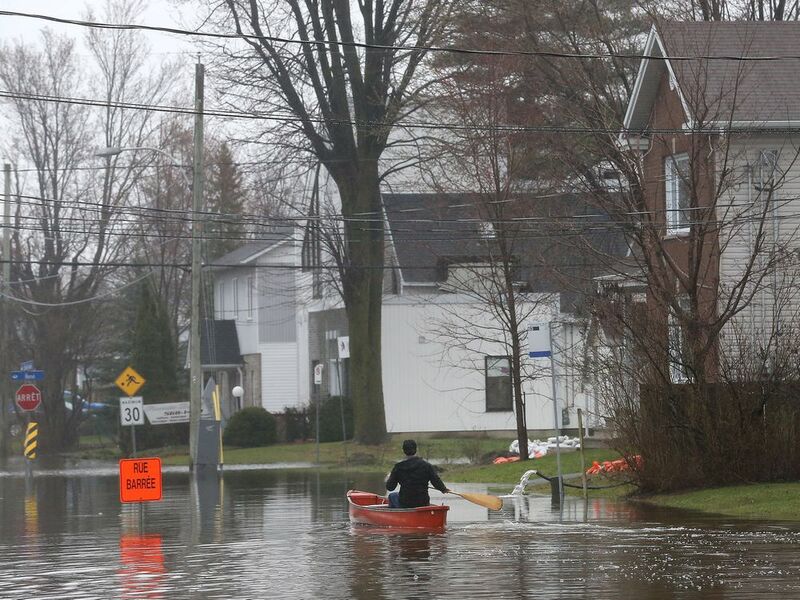 Gatineau: "roads like canals". Today, May 4, and with three days of heavy weekend rain predicted for May 5 - 7 ahead..
Another knock on effect of global warming (and economic "progress" at any price): personal property damage (and the concurrent inconvenience, stress and loss). This is the kind of stuff that barely gets mentioned in official scientific reports on climate change like the Intergovernmental Panel on Climate Change.